On April 16, 2000 thousands of activists converged in Washington D.C. to disrupt the annual meeting of the International Monetary Fund and World Bank. “A16” was the next major action after the massive anti-WTO demonstrations in Seattle in 1999, which helped launch the alterglobalization movement and changed the conversation about “free trade” in North American politics. ISE faculty and students were key organizers and active participants in this movement. 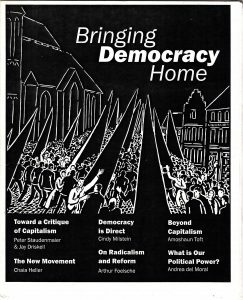 For A16, they produced a pamphlet called Bringing Democracy Home that sought to sharpen and radicalize movement politics, featuring essays about the need to expand direct democracy from a tactic to a broad political vision, and to move from an anti-corporate to an anticapitalist analysis. The pamphlet was widely read and helped give the movement its anticapitalist and directly democratic political vision, one highly influenced by the ideas of Social Ecology. To commemorate the anniversary of this action and the important role played by Social Ecologists, we’re offering the Bringing Democracy Home pamphlet as a downloadable PDF. Although written 16 years ago, its political insights remain highly relevant today.